This morning, I gave students in my Digital History class a very brief overview of Geographic Information Systems. While Digital History students have been working on keying US census data, GIS students at Harrisburg University and Messiah College have been busy finding different ways to relate our data to digitized maps (see Step 4 of this post). In Professor Erikson’s GIS course, for example, students digitized four wards from the 1901 Harrisburg Atlas by tracing buildings as polygons. 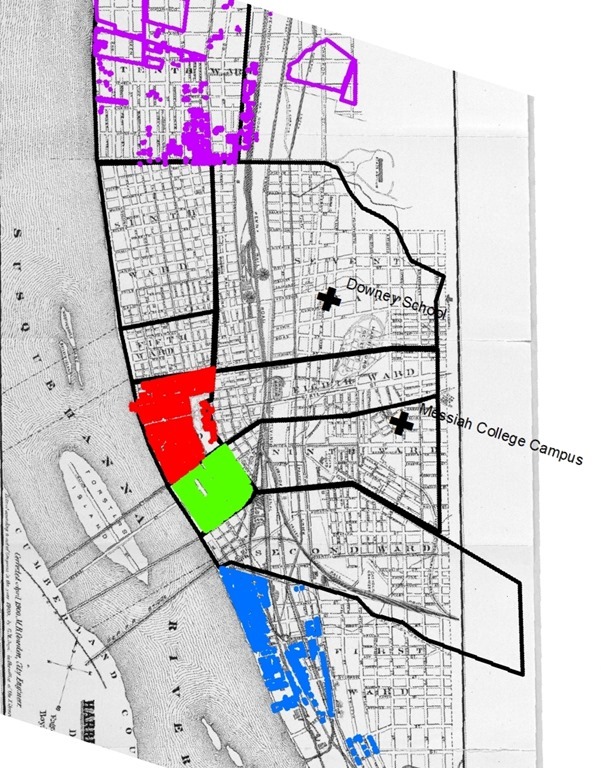 The image below shows the original 1900 Boyd Map, ward boundaries in 1900, and four wards (purple, red, green, blue) digitized by Erikson’s students. Each ward contains hundreds of polygons, each embedded with information from the census. You’ll see also the locations of two important features for Messiah College today: the original campus location and the Downey School. I exported these shape files as a KMZ file that Google Earth could open. 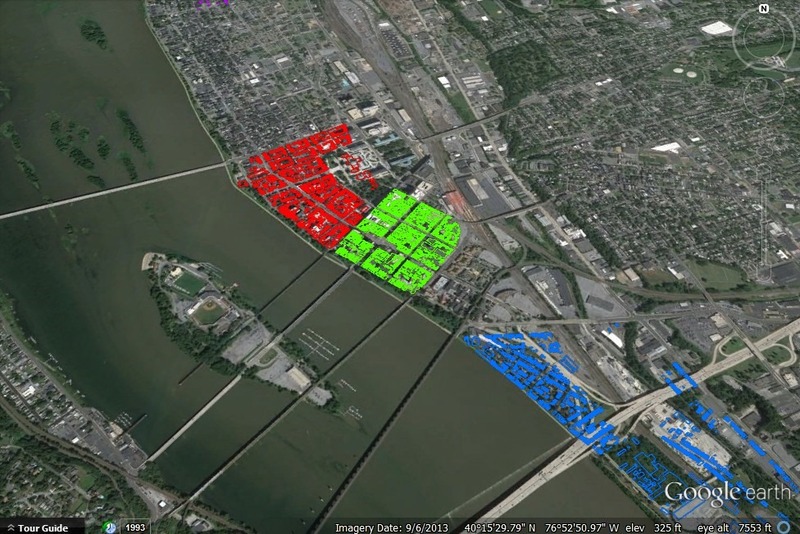 I couldn’t quite get this to work in class for students to see, but the screen shot below shows an aerial view of Harrisburg today, overlaid by shape files created by Professor Erikson’s students. Harrisburg viewed from 7,000 feet – impressive. I hope we’ll get some additional maps together by the end of the semester to show the power of GIS for visualizing social patterns in 1900.